Easy to understand, sustainably built, a project from which we can learn. 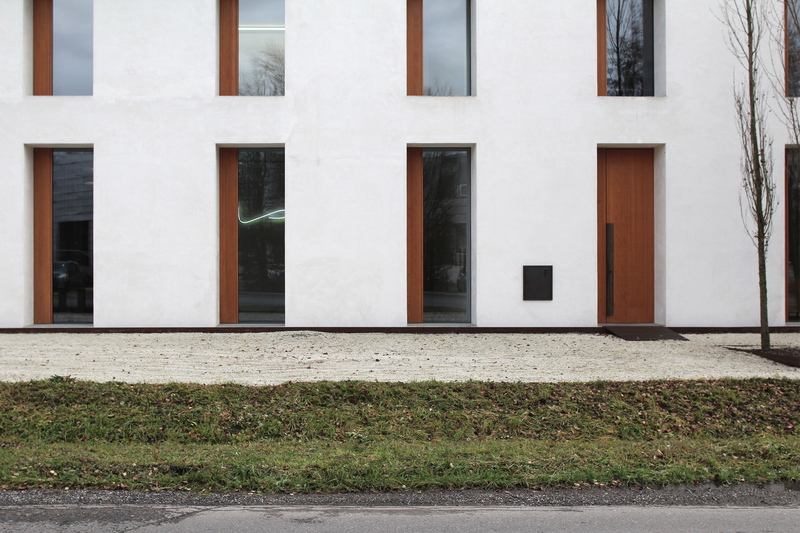 In 2013 Baumschlager Eberle built a mixed-use building without heating and without mechanical ventilation – an innovation. The innovation of the project lies, however, not in a single brilliant idea, but rather in the combination of many well-founded decisions, which together make an innovative result possible. What is wonderful is that these individual decisions are easy to understand as they are based on well-known physical phenomena. The building is designed to maintain a room temperature between 22 and 26 degrees Celsius throughout the year. This corresponds to the temperature range in which a person feels comfortable. Listed below are the measures taken that make this possible without heating and without mechanical ventilation. 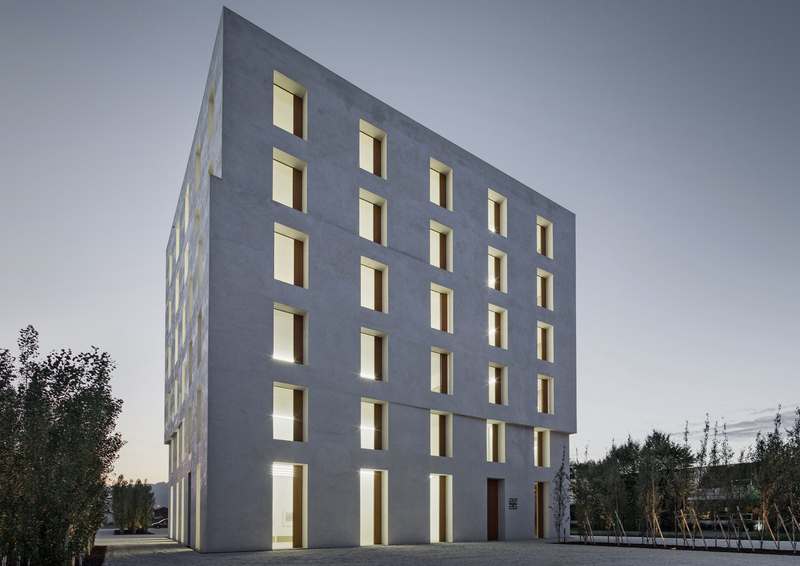 In order to lose as little energy as possible through the façade, the compactness of the building is crucial. The project was planned as a cube with an almost ideal ratio of room volume to facade area of 4.5. The most important heat source in winter is solar gain through the windows. The building’s occupants (80-100 watts per person depending on size), as well as machines such as computers, printers, coffee machines and lighting serve as additional heat sources. Heat gains are stored over the entire annual cycle and released over time back into the rooms. The greater the thermal mass, the greater the thermal stability inside the building. To provide a consistent internal temperature despite varying external temperature it is important to combine materials with different thermal inertia. For example, concrete absorbs and releases heat relatively quickly, a quality that is useful both for the building’s natural ventilation strategy and for night cooling in summer. By contrast, the brick walls react much slower and are responsible for heat retention over a long time period, for maintaining a stable room temperature and for delayed release of stored heat from the summer months. The monolithic brick wall with a total depth of 80cm consists of an outer layer of insulating bricks and an inner layer of load-bearing bricks. The bricks were offset not only vertically, but also horizontally, to make the weak points of masonry construction – the joints from inside to outside – as long as possible. These measures lead to a thermal insulation value of 0.14 W / m2K. Windows make up 16% of the building facades. This value was defined to ensure that the required brightness of 500 lux is reached, but not greatly exceeded. The vertically proportioned windows reach up to the concrete ceiling, ensuring that daylight penetrates deep into the building and that artificial lighting does not normally have to be used. As the percentage of glazing in the façade was kept to a minimum, heat loss through the windows– the building’s thermal weak points despite argon-filled triple-glazing, with a comparatively low U-value of 0.5 W / m2K – was mitigated. In order to further improve these weak points, grooves were cut in the window frames, creating air chambers that provide additional insulation. 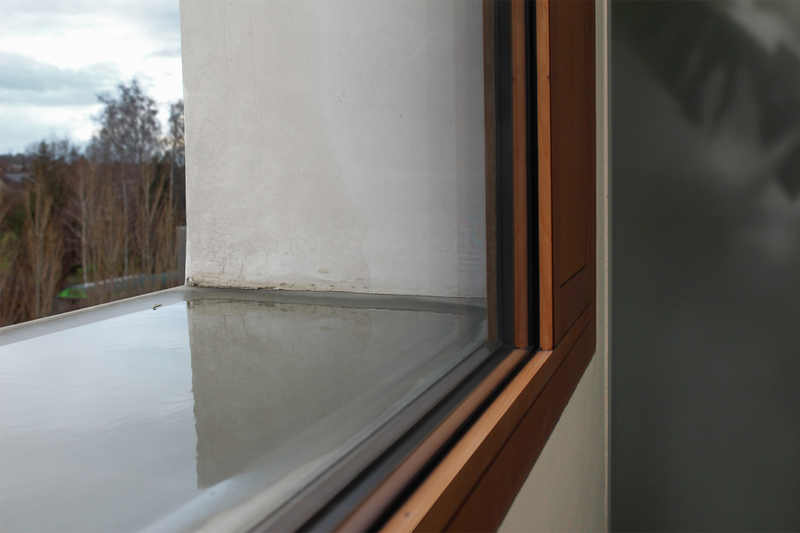 The window vents located at the side of each window – an integral aspect of the building’s ventilation strategy – were constructed with a vacuum insulation layer of 3cm, giving them a U-value 0.3 W / m2K. Ventilation is based on dynamic user behaviour. Each room is equipped with a CO2sensor and the window vents are only opened if a predefined CO2limit value is exceeded. This is a particularly interesting solution, as when the space is least used, for example, at the weekend, little or no ventilation is required, the vents remain closed and so no heat is lost. With frequent or intense use, however, the time between ventilation periods is shorter to ensure that the CO2 limit is not exceeded. The resulting heat losses caused by additional ventilation periods are compensated by heat gains from occupants and computers. With normal occupancy, 3 to 4 ventilation periods are expected per day. 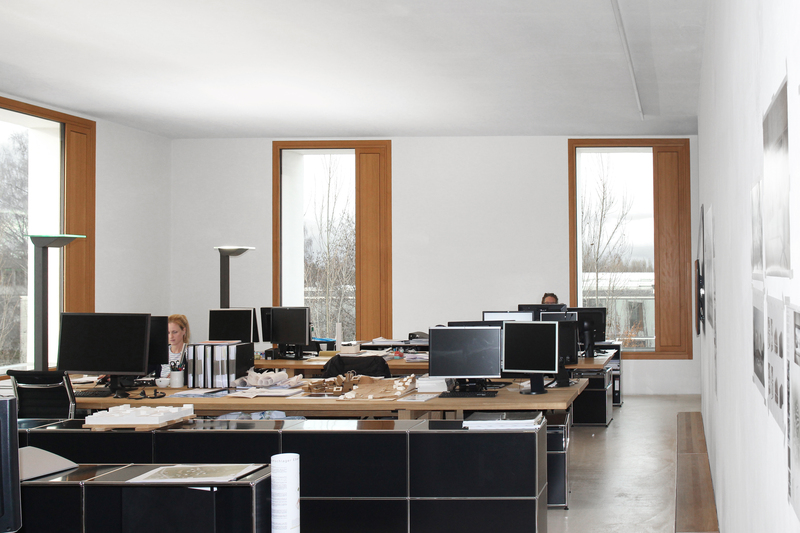 For the building’s natural ventilation strategy a large volume of air is needed. The larger volume of air means that it takes longer for the CO2limit to be reached. With an average occupancy of one person per 10m2, a room height of 3.3m was planned in the upper floors and 4.3m in the ground floor where gatherings of larger numbers of people need to be accommodated. 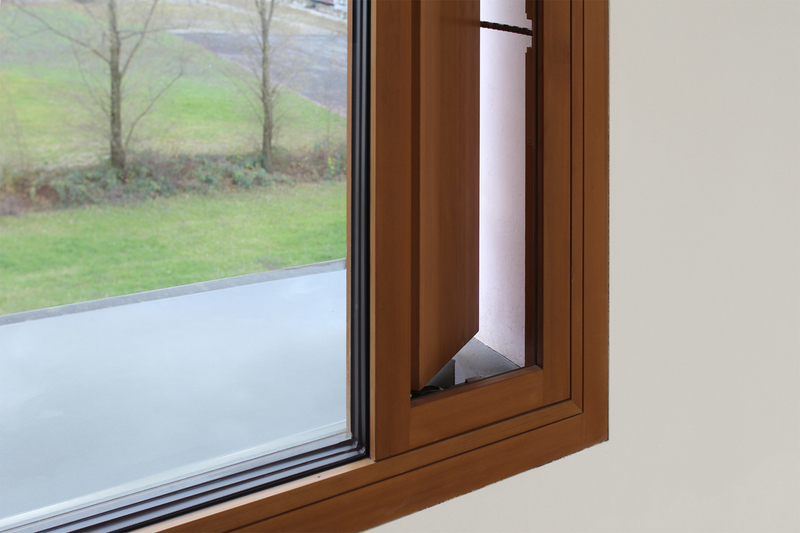 To ensure that as much air exchange is achieved in as short a ventilation period as possible, the window vents are vertically proportioned and open the full height of the room. Thus natural thermal behaviour can be exploited to remove CO2-saturated air from the top of the room, while allowing fresh air to flow in from below. During ventilation periods CO2-saturated warm air is removed and replaced with cold fresh air. These periods last until the defined CO2value is reached (generally between 10 and 20 minutes). In order to heat the cold fresh air in a very short time, great attention was paid to the heat retention qualities of the materials used and the heat exchange capability of material surfaces. The concrete floor slabs, which make up 74% of the building mass and have a density of 2 to 2.5 tonnes / m3, are particularly suitable for short-term heat exchange between ventilation periods. Long-term heat retention is provided by the inner and outer brick walls, which make up 24% of the building mass and have a density of 600 to 800 kg / m3. It is known that surface temperatures of a room contribute more to thermal comfort than air temperature. For this reason, short-term changes in air temperature during ventilation periods do not significantly affect the thermal comfort of the building’s users. Once ventilation has been completed, the air is quickly warmed up by heat stored within the building fabric. While the concrete slabs provide heat retention, the brick external walls act as a filter between outside and inside temperatures. A tailor-made building control system was developed in order to successfully implement 2226’s innovative approach. The building controls take two scenarios into account: ventilation and cooling in summer. While ventilation usually takes place during working hours, summer cooling mainly takes place at night. A weather station on the roof measures temperature and wind speed and is also provided with a rain sensor. Room sensors provide information regarding CO2levels and inside temperature. Using a simple algorithm these two sets of information together determine whether the window vents open or close. 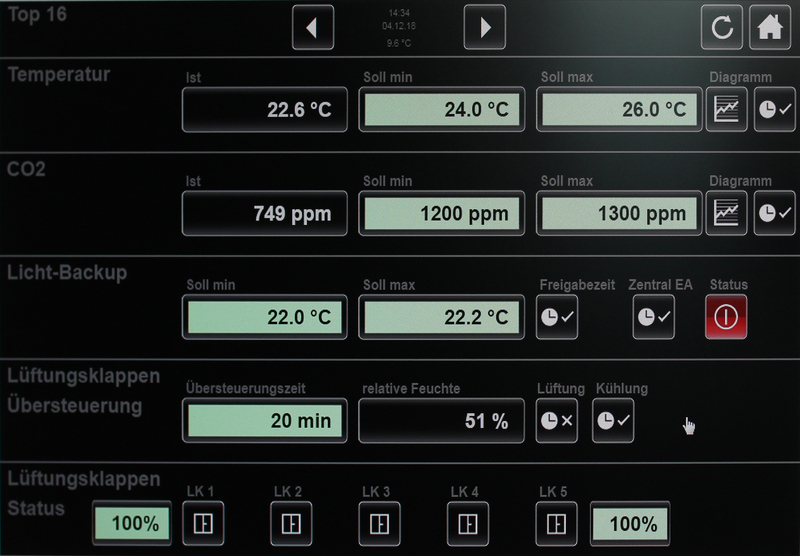 These functions and values can be individually accessed using a touch panel and can be regulated as required. This allows users to intervene independently of pre-programmed values. It was a main concern of the energetic concept’s designers, Dietmar Eberle, Lars Junghans and Peter Widerin, that the concept should follow the needs of the users and not the other way around. Electricity consumption in the first three years of operation averaged 54kWh/m2a, which is around half the usage of a conventionally serviced commercial building. The deep recessed windows, along with the depth of the façade as a whole, provide shade in summer when the sun is high while allowing high solar gains in winter when the sun is low. The position of the windows made it possible to dispense entirely with external solar shading, or with solar shading glass. Curtains are used inside to prevent glare. The sandstone windowsills provide an unexpected and refreshing detail. Designed as basins, they collect rainwater, a total of 25 litres per window. Normally, it doesn’t rain so much to cause the water to overflow. Instead, the collected rainwater remains in the window reveal and evaporates over time. This provides additional cooling of the building envelope in the summer. In addition to this functional aspect, this detail also has an aesthetic component. After a downpour, the water surface reflects the sunlight deep into the building and every now and then a bird makes a stopover to freshen up in this temporary pond. This leads to an exciting transitional space that oscillates between building and nature. Einfach nachvollziehbar, nachhaltig gebaut, ein Projekt von dem man viel lernen kann. Baumschlager Eberle hat 2013 ein gemischt genutztes Gebäude ohne Heizung und ohne mechanische Lüftung erstellt. Das ist eine Innovation. Die Innovation des Projekts ist nicht eine brillante Idee, sondern die Kombination von vielen fundierten Entscheiden, welche in der Summe das innovative Resultat ermöglichen. Das wunderbare daran ist, dass die einzelnen Entscheide, wie und warum diese getroffen wurden, einfach nachvollziehbar sind, da sie sich auf bekannte physikalische Phänomene beziehen. Das Gebäude ist so ausgelegt, dass über das ganze Jahr im Innenraum eine Temperatur zwischen 22 und 26 Grad Celsius herrscht. Dies entspricht der Temperatur in der sich ein Mensch wohlfühlt. Nachfolgend sind die getroffenen Massnahmen aufgelistet die ermöglichen, dass dies ohne Heizung und ohne mechanische Lüftung auch funktioniert. Um möglichst wenig Energie über die Fassade zu verlieren ist die Kompaktheit des Gebäudes ausschlaggebend. Das Projekt wurde als Kubus geplant mit einem nahezu idealen Verhältnis von Raumvolumen zu Fassadenfläche von 4.5. Die wichtigste Wärmequelle im Winter sind die solaren Erträge über die Fenster. Die Menschen (80-100 Watt je nach Grösse), Maschinen wie Computer, Drucker, Kaffeemaschinen und die Beleuchtung dienen als zusätzliche Wärmequellen innerhalb des Gebäudes. Die Wärme wird über den gesamten Jahreszyklus gespeichert und zeitlich verschoben wieder in den Raum abgegeben. Umso grösser die thermische Masse umso grösser ist die thermische Stabilität im Gebäude. Es ist dabei wichtig die Materialien so zu kombinieren, damit diese unterschiedliche Trägheiten in Bezug zur Wärmespeicherung aufweisen. So nimmt zum Beispiel der Beton relativ schnell Wärme auf, gibt diese jedoch schnell wieder ab, eine Qualität die für die kurzen Lüftungsintervalle und im Sommer auch für die Nachtauskühlung eingesetzt wird. Die Backsteinwände reagieren dagegen viel langsamer und sind für die Verschiebung der Temperaturkurve über die Jahreszeiten verantwortlich. Das Einsteinmauerwerk mit einer Gesamttiefe von 80cm besteht aus einer äusseren Schicht aus Dämmbacksteinen und einer inneren Schicht aus tragenden Backsteinen. Nicht nur die vertikalen, sondern auch die horizontalen Lagerfugen wurden versetzt aufgemauert, damit die Schwachstelle des Mauerwerks, die Fugen von Innen nach Aussen länger werden. Diese Massnahmen führen zu einem Wärmedämmwert von 0.14 W/m2K. Der Fensteranteil beträgt 16% der Fassadenfläche. Dieser wurde so definiert, damit die zum Arbeiten benötigte Helligkeit von 500 Lux erreicht, jedoch nicht gross überschritten wird. Die hochstehenden Fenster reichen bis unter die Betondecke, damit das Licht tief ins Gebäude scheint und so die künstliche Beleuchtung im Normalfall nicht eingeschaltet werden muss. Durch den niedrigen Glasanteil wurde die Schwachstelle der Fassaden, die Fenster, welche mit einer Dreifachverglasung mit Argongas einen U-Wert von 0.5 W/m2K aufweisen, massiv reduziert. Um die Schwachstellen weiter zu reduzieren wurden Einfräsungen bei den Fensterrahmen vorgenommen, welche als Luftkammern zusätzlich isolieren. Bei den Lüftungsklappen, die seitlich der Fenster angeordnet sind wurde eine Vakuumdämmplatte von 3cm eingebaut damit diese einen U-Wert 0.3 W/m2K erreichen. Bei einer natürlichen Lüftung, welche über zwei Fassadenseiten (Querlüftung) angeordnete Lüftungsflügel funktioniert, sind mehrere Massnahmen notwendig damit die Lüftungsintervalle kurz gehalten werden können. ein dynamisches Lüftungsverhalten, das heisst die Lüftungsflügel werden nur geöffnet, wenn der C02-Grenzwert überschritten wird. Jeder Raum ist mit einem C02-Sensor ausgestattet. Dies ist spannend da bei geringer Nutzung zum Beispiel am Wochenende, wenig oder gar nicht gelüftet wird und so auch keine Wärme verloren geht, bei starker Benützung hingegen werden die Lüftungsintervalle kürzer damit der C02-Grenzwert nicht überschritten wird, die dadurch verlorene Wärme wird durch die zusätzlich anwesenden Menschen und die in Betrieb stehenden Computer kompensiert. Bei normaler Belegung werden 3 bis 4 Lüftungsintervalle am Tag erwartet. weiter wird ein grosses Luftvolumen benötigt, dadurch wird der C02-Grenzwert später erreicht. Aus diesem Grund wurde bei einer durchschnittlichen Belegung von einer Person pro 10m2 eine Raumhöhe von 3.3m in den Obergeschossen eingeplant. Im Erdgeschoss wo Anlässe mit vielen Personen stattfinden können, wurde ist die Raumhöe 4.3m. damit die kurzen Lüftungsintervalle einen hohen Luftaustausch ermöglichen sind die Lüftungsflügel hochstehend und öffnen bis unter die Geschossdecke. Somit wird oben die C02-gesättigte Luft abgeführt, während unten durch das natürliche thermische Verhalten Frischluft einströmt. Bei den Lüftungsintervallen wird C02 gesättigte warme Luft abgeführt und durch kalte frische Luft ersetzt. Die Lüftungsintervalle dauern zwischen 10 und 20 Minuten, bis der definierte C02-Wert erreicht ist. Um die Frischluft innert kürzester Zeit zu erwärmen, wurde der Wärmespeicherung der Materialien und der Wärmeausstauschfähigkeit der Materialoberflächen grosse Bedeutung beigemessen. Für die kurzzeitige Wärmespeicherung (bei den Lüftungsintervallen) eignen sich die Betondecken, welche 74% der Gebäudemasse ausmachen und eine Dichte von 2 bis 2.5 Tonnen/m3 aufweisen. Die Langzeitspeicherung erfolgt über die Innen- und Aussenwände aus Ziegelsteinen, welche 24% der Gebäudemasse ausmachen und eine Dichte von 600 bis 800 kg/m3 aufweisen. Es ist bekannt, dass die Wandtemperatur stärker zum Wohlbefinden des Menschen beiträgt, als die effektive Raumtemperatur. Aus diesem Grund bedeuten die kurzzeitigen Temperaturgefälle während der Lüftungsphase keine merklichen Einbussen für das Wohlbefinden der Benutzer. Ist der Lüftungsintervall abgeschlossen, wird die Luft durch die Speicherwärme innert kürzester Zeit erwärmt. Während die Betongeschossdecken massgeblich als Wärmespeicher fungieren, ist das Einsteinmauerwerk der Fassade ein Filter zwischen der Aussen- und Innentemperatur. Um den innovativen Ansatz in der Praxis erfolgreich umzusetzen, wurde eine massgeschneiderte Steuerung entwickelt. Dabei wird zwei Szenarien Rechnung getragen, einerseits der Lüftung und andererseits der Kühlung im Sommer. Während die Lüftung normalerweise während der Arbeitszeit stattfindet, findet die Auskühlung im Sommer hauptsächlich in der Nacht statt. Eine Wetterstation auf dem Dach mit Regensensor misst die Temperatur und die Windgeschwindigkeit. Diese Information ist mit den Raumsensoren so gekoppelt, sodass sich je nach programmierter Bedingung die Lüftungsklappen entweder öffnen oder schliessen. Damit die Lüftungsklappen effizient wirken sind diese vertikal eingebaut um von der Thermik zu profitieren. Diese beiden Funktionen „nach Temperatur“ und „nach C02-Gehalt“ sind je nach Aussentemperatur mittels einem logischen „und“ oder einem logischen „oder“ gekoppelt. Diese Funktionen und die Werte können über ein Touchpanel im Raum individuell abgerufen und je nach Bedürfnis reguliert werden. Dies erlaubt es den Benutzern unabhängig der vorprogrammierten Werte einzugreifen. Den Entwerfern des energetischen Konzepts, Dietmar Eberle, Lars Junghans und Peter Widerin war es ein grosses Anliegen, dass sich das Konzept nach dem Menschen und nicht der Mensch nach dem Konzept richtet. Der Stromverbrauch in den ersten drei Betriebsjahren lag im Durchschnitt bei 54kWh/m2a was ungefähr der Hälfte eines kommerziell genutzten Gebäudes entspricht. Das Zusammenspiel der dicken Fassadenhülle mit der innenliegenden Verglasung führt zu einer starken Verschattung im Sommer (hochstehende Sonne) und im Winter zu einer hohen Ausbeute der solaren Gewinne. Dies erlaubte es auf einen aussenliegenden Sonnenschutz, oder ein Sonnenschutzglas gänzlich zu verzichten. Wenige Vorhänge im Innenraum können für den Fall der direkten Sonneneinstrahlung vor die Fenster gezogen werden, um den Blendeffekt zu verhindern. Mit einem unerwartet erfrischenden Detail wartet der Fensterbank aus Sandstein auf. Dieser ist als Wanne ausgebildet und sammelt das Regenwasser, insgesamt 25 Liter pro Fenster. Im Normalfall regnet es nicht so viel, dass das Wasser über die Fassade abgeführt werden müsste. Das gesammelte Regenwasser verbleibt in der Leibung und verdunstet mit der Zeit. Dies unterstützt im Sommer die Kühlung der Gebäudehülle. Das Detail hat neben der funktionalen auch eine ästhetische Komponente. So reflektiert nach einem Regenguss die Wasseroberfläche das Sonnenlicht tief ins Gebäude und ab und an macht ein Vogel einen Zwischenhalt um sich im temporären Teich zu erfrischen. Dies führt zu einem spannenden Übergangsraum der zwischen Gebäude und Naturraum oszilliert.